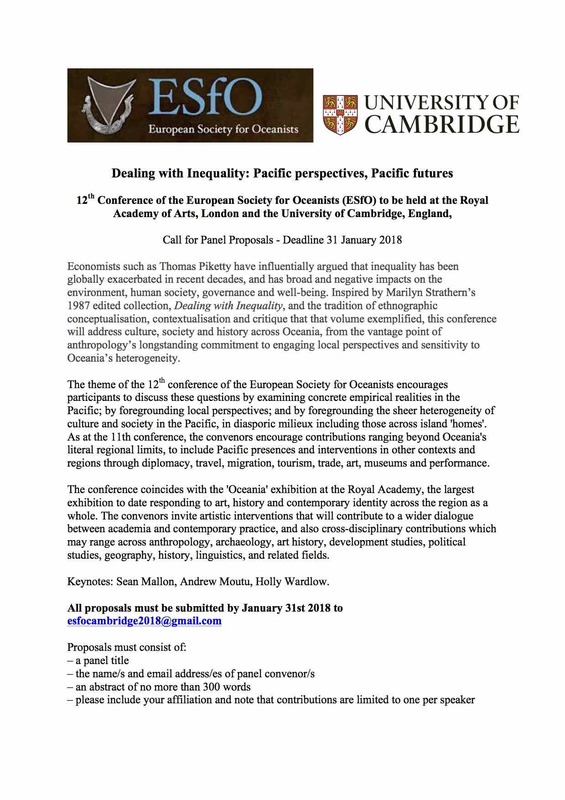 The theme of the 12th conference of the European Society for Oceanists encourages participants to discuss these questions of inequality by examining concrete empirical realities in the Pacific; by foregrounding local perspectives; and by foregrounding the sheer heterogeneity of culture and society in the Pacific, in diasporic milieux including those across island ‘homes’. As at the 11th conference, the convenors encourage contributions ranging beyond Oceania’s literal regional limits, to include Pacific presences and interventions in other contexts and regions through diplomacy, travel, migration, tourism, trade, art, museums and performance. The conference coincides with the ‘Oceania’ exhibition at the Royal Academy, the largest exhibition to date responding to art, history and contemporary identity across the region as a whole. The convenors invite artistic interventions that will contribute to a wider dialogue between academia and contemporary practice, and also cross-disciplinary contributions which may range across anthropology, archaeology, art history, development studies, political studies, geography, history, linguistics, and related fields.